Tremolo is an Italian term for a musical effect in which a note is repeated at a rapid pace and wavers, or trembles. For Chris Gleason and Caroline Williamson, the word also recalls trembling of the over-caffeinated variety. Located in the Front gallery at 6 Barre Street, and open 8 a.m. through noon Monday through Saturday, Tremolo aims to provide customers with just the right amount of java. As lovers of music on vinyl, the owners plan on having a player and LPs in the space. For now, they offer regular and nitro cold brew, and use the pour-over technique for making hot coffee. Beans come from Burlington's Brio Coffeeworks, and soon they'll start sourcing from Northfield's Carrier Roasting, as well. The minute attention to detail — weighing out the beans, grinding them to order and allowing the water to drip through — takes some time, but Gleason says it provides a superior cup and allows customers to participate in the process. 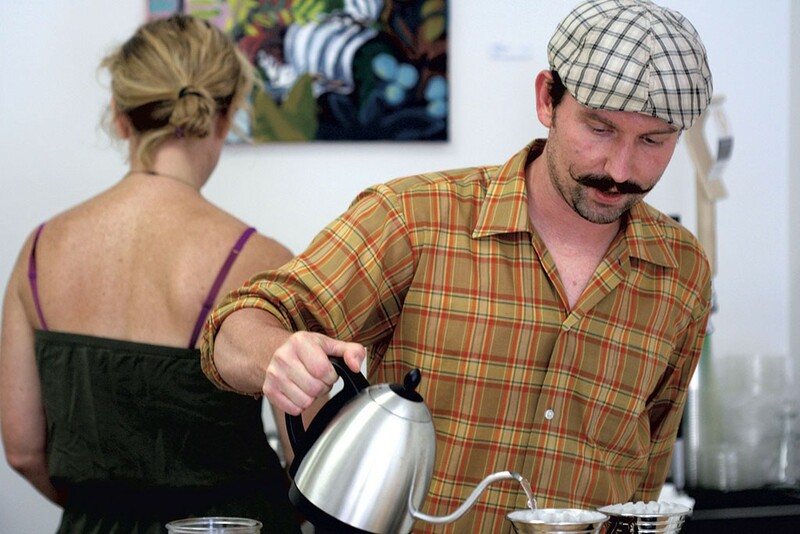 He and Williamson encourage visitors to ask questions while they make the coffee, and to hang out in the gallery as they drink. This is all part of the community vibe Gleason and Williamson hope to create and, eventually, to bring to a permanent location in downtown Montpelier. "Our full café will be more of a community art space with live music, foreign movies ... We want it to be a place where people feel comfortable and can have a coffee and express themselves," says Gleason. The original print version of this article was headlined "Pop-Up Shop"